This week I will explain the AWS S3 buckets details. In my previous post I explained the fundamentals of S3 and created a sample bucket and object. We use S3 buckets to store our objects. Buckets have properties like permissions, versioning, life cycling etc. The most important thing about the buckets are bucket permission and today’s post will cover this subject. First of all I should say that Amazon has three S3 permission sets. Bucket policies and IAM policies gives us fine level of control. ACLs are used for general permissions( high-level). First of all I will explain ACLs (bucket permissions). Basically, ACLs define the grantee and the actions it can take on the bucket. When we create a bucket by default all actions permitted to our root account. We can add or remove additional permissions and can use AWS built-in groups as the grantee. Authenticated Users – This should be an AWS account’s either email address or canonical user ID. Log Delivery – This group is used if you enabled logging on your bucket. List – Permission to view a list of the objects in the bucket. So if we want a public bucket that has only permission to view the object, we should add more permission and use “Everyone” as grantee and “List” as the action. Ok now let’s make some tests with ACL. First of all I will create two buckets named “wekanban.demo.s3” and “wekanban.everyone.access” as shown below. For “wekanban.demo.s3” bucket I will give permission “List” ( read ) and as a grantee I will use another account’s canonical user ID. For “wekanban.everyone.access” I will give permission “List” again and as a grantee I will use “Everyone”. As you see, ACLs gives us to configure permissions at a high level. You can also try to give upload/delete permission and test the result again. Now we can talk about the bucket policies. As I mentioned before, bucket policies give us fine level of control. For example, we can permit that an ACL can be attached to bucket or restore an object in the bucket. To create a bucket policy, we will use AWS Policy generator. 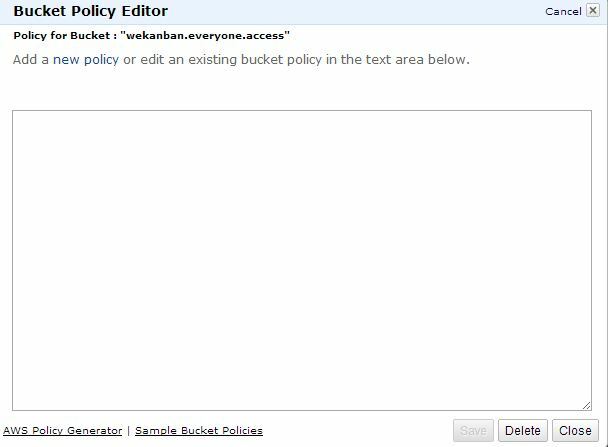 In S3 console, when I click the “Add bucket policy” , I can paste my policy or use the policy generator. Let’s use the generator. If I click “Add Statement” and then “Generate Policy”, policy generator will create my json based policy. Now let’s try if it works. Now I will use a basic python script to test. I use another account’s key and secret in my code to test if policy works. And the result as expected, I can list the ACL associated with the bucket even if I am not the user. Now let’s change it and give permission to list the bucket tags: Again I click “Add bucket policy” and change the policy. I will also change my script. Here again I give permission for the “s3test” user: As you see I use the same resources for list and put actions. Ok it is time to test now. Again I will use AWS S3 cli. First I will try to list the objects in the bucket. Now I will try to put an object. If I use an account not permitted to list and put , I will get error as shown below. Ok that was the S3 bucket permissions. If you have any question or comment, please feel free to write and don’t forget to share please. You can also check Udemy’s s3 course if you want.